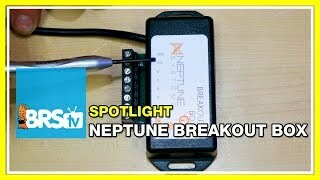 Customize your Neptune Apex Controller with the I/O Breakout Box. Add float switches, magnet switches, or any other open/closed device. 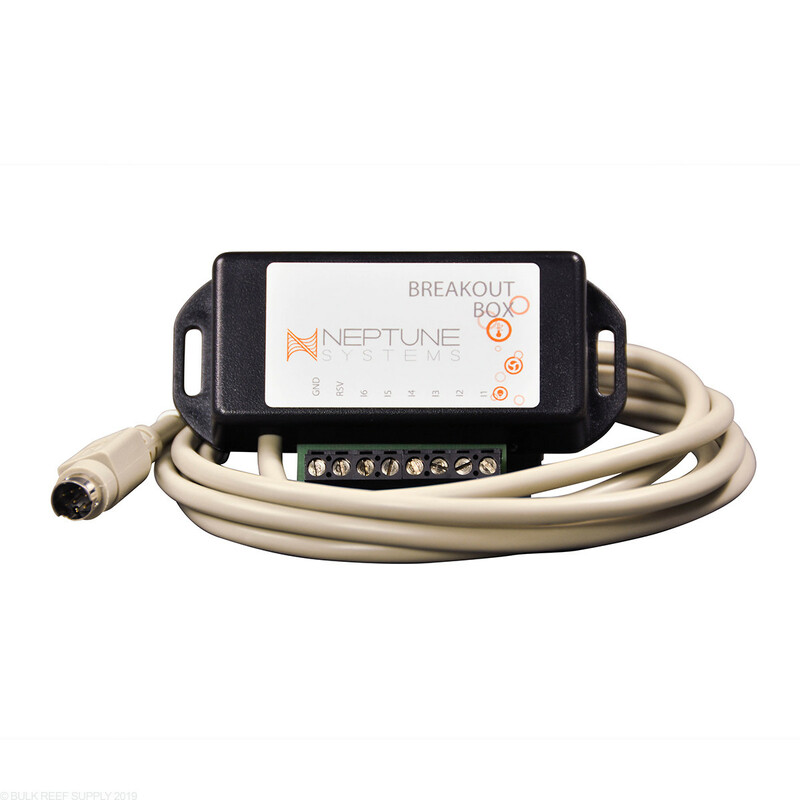 The Breakout box does not power any accessories, but lets you monitor the signal of the switch connected to it, and then you can program your Apex controller to react to the change in the status. The breakout box can connect to any open I/O port on an Apex Controller System. Besides the typical float switches, the options that you unlock with your Apex and a breakout box are virtually endless. Below are a short list of examples for possible switches and what they can accomplish. This does exactly what it should, but it has a few annoying design flaws. First, there is only one ground contact, so you have to try and shove all the ground wires into a single hole and hope one doesn't fall out. Would it have been that tough have a pair of connections for each input? Also, the screws recessed and too small for a regular screwdriver; you need a jeweler's screwdriver to tighten them. Aside from those issues it certainly works fine, but I agree with the above poster - the Avast breakout box is a better design. Setup switches to turn on and off equipment without login into anything. Float switches can also be utilized with this breakout box. Absolutely love this thing. Have it running my ambient lighting for my stand and several float switches. Very easy to set up and the possibilities are endless. Using it for my leak detectors, automatic cabinet LEDs and float switch warning notification. Works perfect with no issues. Got this to use on my NEW Apex 2016 model. Pretty much plug and play..except you will NOT see it on Fusion until you actually wire something up to it...just plugging it in will not recognize the BOB. Once I wired my float switch into it, it shows right up. Im using this as a 3rd switch to turn OFF my ATO if the other 2 fail. Endless possibilities for uses...Im sure I will wire more things into it. I have mine monitoring my DT overflow to turn off the return pump if the drain gets clogged and prevent an overflow onto my floors. A magnetic door switch to turn on the fuge light whenever I open the sump/stand door so that I can actually see when I'm looking around inside my sump area. And I picked up a few leak sensors and have those hooked up to the breakout box instead of spending much more on the an ALS and sensors. I'm coming to think that this may be the best part of the Apex system. I was worried about overflowing, so I hooked up some float switches to send emails to me. I hate working in a dark sump, so I wired some magnetic switches to turn on a light when I open the stand doors. I wanted to speed up maintenance, so I stuck a button in a box to to automatically turn off and on equipment as needed. Pretty much plug and play, just be mindful it where its plugged in, because that effects the switches names when programming. Wish the first comment had been there when I bout this module. I own an Apex Junior, and my ATO system died. I bought this to use to make an ATO system, only to find out that in order to use it with an Apex Junior, you also have to buy another module (PM1 or PM2) which then pushed to cost too high, and made it much more affordable to simply buy a stand alone ATO. If you have an Apex, GO FOR IT! If you have an Apex Jr, don't. They sure will. The RK comes with two pieces of wire, one has a 2 pin plug on it and bare leads on the other, the other is the float switch with bare wires. When used with there equipment you connect the two together after the float switch is secured to the bracket. In your case you would just toss that pigtail with the 2 pin connector and use the float switch with the bare wires. Which apex controllers is this compatible with? jr? lite? The I/O breakout box is compatible with all versions of the Apex so long as you have an available I/O port. On the regular Apex this is a port that is built into the head unit, if you have a different version, or have used up the port, you may need to add an additional module to give yourself a free I/O port to plug the breakout box into. The breakout box measures: 3.8" x 2.1"
Are there any guidelines on wire thickness vs. distance? Can any braded type wire (lamp wire, 18/2) be used? The breakout box can use pretty thin wire. It is a very low voltage signal that is passed through and lamp cord should work, but maybe a little thick for the terminals. We have found some really thin speaker wire works really well for the breakout box. They can be used well over 50 feet from the source with thicker gauge wire. Neptune has informed us that some customers have taken an ethernet cable wires apart and used the wires to run well over 50'. Feel free to let us know if you have any further questions! For leak detection probes, you will need either the ALD module or FMM module. Each has its own probe options with different plugs depending on the module you use. If we can be of further assistance, please let us know! Does this item work with the "New" Apex 2016 system? What does this connect to? Will it connect to the energy bar or does it have to connect to the head unit? It depends on which apex unit you have. If you have a full apex system it will connect to the "I/O" port on the head unit. If you need to add more then one, or have an Apex Jr, then you would need to pick up a probe module 1 or probe module 2 which will give you additional I/O ports.